Contents: E.A. Fleishman, Introduction. E.A. Alluisi, Stress and Stressors, Commonplace and Otherwise. W.D. Chiles, Workload, Task, and Situational Factors as Modifiers of Complex Human Performance. W.L. Wilkens, Psychophysiological Correlates of Stress and Human Performance. 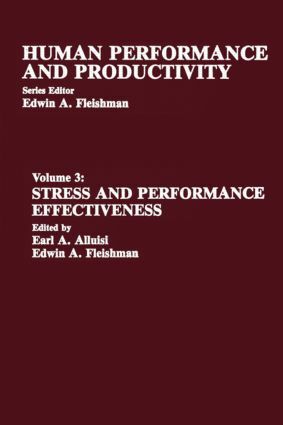 G.D. Coates, R.H. Kirby, Organismic Factors and Individual Differences in Human Performance and Productivity. R.T. Hogan, J.C. Hogan, Subjective Correlates of Stress and Human Performance. E.A. Alluisi, B.B. Morgan, Jr., Temporal Factors in Human Performance and Productivity.